So, Australia, when did racism become OK again? So: when did we all get so cool with being racist? Gotta say, our national hatred of brown people really sneaked up on me, not least because I’m a white middle-class straight man and therefore demographically the least likely sort of person to encounter open bigotry while at the same time being the most likely sort of person to angrily demand my right to dispense it. Now, you might think I’m overreacting, but you know what? No, I’m not. The biggest message that our government – and, let’s be clear, federal opposition – has put forward is that we need to Stop the Boats. And we all know why that is. It’s certainly not because of the cost of dealing with asylum seekers, since it was orders of magnitude cheaper to house people in Australia, process their application and then either deport them or release them into the community, as opposed to the millions it’s costing us every month to use our Navy to drag ships back out to sea while we imprison people indefinitely on isolated islands where all food, water and fuel needs to be expensively shipped in. It’s not because they’re a danger to us or our way of life: people who’ve given all their money to people smugglers in a last-ditch effort to escape their country aren’t exactly brimming with resources and options. Sure, some folks argue that there are people who deserve to be here and people who do not. And I can’t help noticing that those who apparently do not deserve to be here coincidentally tend to have complexions rather duskier than those of our federal front bench. And we know it’s not a matter of gosh-darn principle about people playing by the rules. After all, we don’t incarcerate Irish overstayers. We don’t send US students with expired student visas to Manus Island. We don’t jail English folks who’ve decided to do sneaky bar work while ostensibly here on a holiday visa. So let me spell it out in nice, unambiguous terms: the people that want our help the most are varying shades of brown, and Australians just don’t like brown people. We sure as hell don’t like the brown people who were here when the First Fleet arrived, since then we’d have done something about the fact that they live, on average, a decade less than non-indigenous folks – and even less if they live in remote communities (between 12 and 14 years less, specifically). And let’s reflect on our recent history. In February a young brown man named Reza Barati was murdered during a detention-centre riot on Manus Island. And our government are not at all keen to investigate this murder properly, hence shrugging at the deportation of the chief investigator and the refusal of the Australian Federal Police to help local police in PNG, despite a direct official request. That came after a human rights inquiry into the centre was shut down, incidentally. Then less than a month after the abovementioned prisoner had his skull bashed in with a piece of wood, our snowy white attorney general George Brandis announced that our anti-discrimination laws are too repressive and needed reform because “people have the right to be bigots, you know”, and he was concerned that bigots weren’t being adequately protected. Oh, Australia, will no one think of the bigots? Then our immigration minister Scott Morrison suddenly removed all legal aid for asylum seekers this week, which seems fair only if it turns out that everyone who desperately flees here with nothing more than the shirt on their back is fluent in English and also an experienced lawyer with particular expertise the constantly changing legislation regarding Australia’s immigration policies. The fact that he did so immediately before getting rid of a group of detainees taking legal action against the Department of Immigration for making their private details public shows what an odious trick it was: aid was cut on Monday, the detainees are being relocated to remote WA on Thursday, and the case comes before the Federal Court in Sydney on Friday. In all of these cases, the people insisting that people had had it too good for too long were of one race, and the people they were putting at disadvantage were coincidentally not that race. And I don’t think we realised how bad it was getting. And it’s not just me who’s noticed. There’s no shortage of overseas editorials about Australia’s virulent bigotry at the moment. 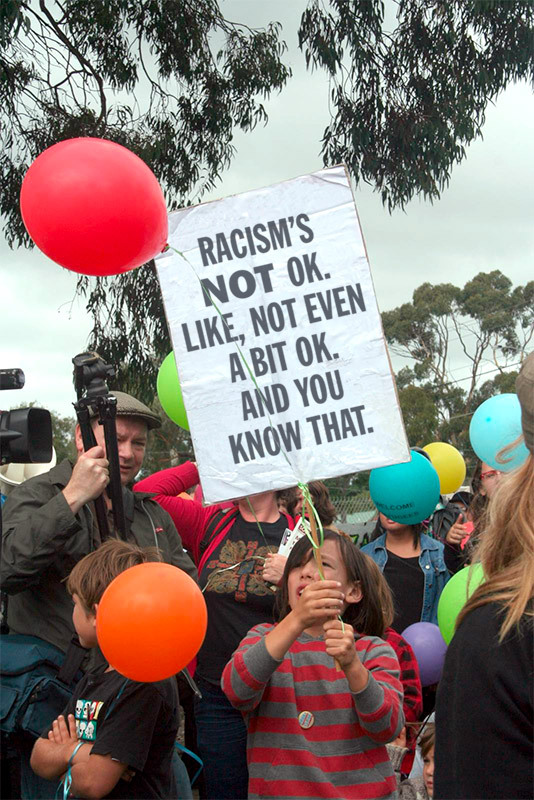 And just to be clear, racism’s not OK. Like, not even a bit OK. And you know that. And you’re probably right. So prove it. Right now. Click on this link and donate whatever you can afford right now to the Asylum Seeker Resource Centre, who – among other things – provide legal aid to the people who now have no other option. Show that you aren’t scared of helping people. Get a glorious thrill of righteousness knowing that you’ve made a practical difference, however small. Even a tiny pebble can be the thing that triggers the avalanche, right? And yes, it’s something small. We can do more, and we will do more. But right now, today, we can do this.